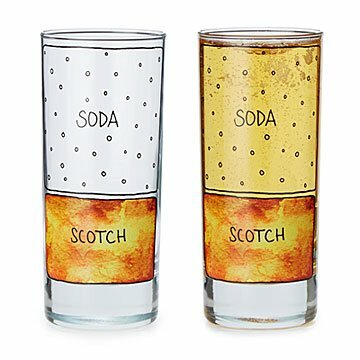 These scotch and soda glasses are printed with an original diagram depicting the classic cocktail. Attorney-turned-artist Alyson Thomas's playful graphics mean the formula for a scotch and soda is always at hand. Her hand-drawn, graphic representation of the classic cocktail adorns these highball glasses--the traditional vessel in which it's served-- with a playfully pseudo-scientific rendering of the drink's essential components: scotch and club soda, both in relative proportions to mix a perfect cocktail with intuitive flair. Glassware made in New Jersey. Decorated in Minnesota. Check out Alyson Thomas's other Cocktail Diagram Glasses: Martini Diagram Glassware, Margarita Diagram Glassware, Vodka Tonic Diagram Glassware, Gin and Tonic Diagram Glassware, Mojito Diagram Glassware, Mimosa Diagram Glassware, and Hot Toddy Diagram Glassware. 6" H x 2.375" diameter; 10 oz.